This property is an immaculate end of terrace townhouse which has been modernised throughout in recent years. As you enter the property on the ground floor there is a small terrace to the front which is large enough for a small table and a couple of chairs. The ground floor is open plan with the modern fully fitted kitchen to the front, this opens to the dining area and then onto the lounge which is at the rear of the property. At the rear, there are patio doors that lead onto the large terrace which has awnings to protect from the sun and give extra privacy if required. The ground floor also has a WC and the stairs that lead down to the underground garage (for 3 cars) and the storage room. On the first floor there are 2 x double bedrooms both with fitted wardrobes and the rear bedroom also has an en-suite with a very large walk-in shower. Also on this floor is a family bathroom. The second floor houses and large versatile room that can be used as a bedroom but is currently arranged as a second lounge. 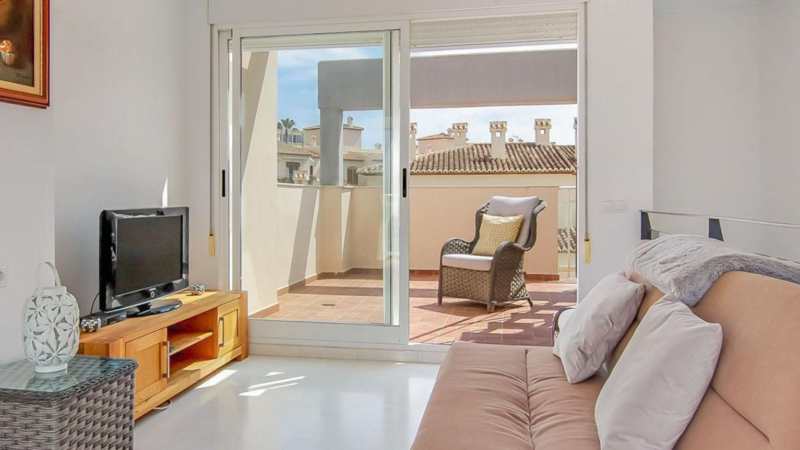 This room has patio doors on either end with a terrace to the front and rear of the property. The front terrace has fantastic view of the Montgo. From the rear terrace there are metal steps that lead up to the roof terrace. The property benefits marble floors, hot/cold ducted air conditioning (ground and 1st floor), ceiling fans and double glazing. The development is only a short walk to the local restaurants and shops and only a little further is the Arenal beach. It has aa large swimming pool, a children’s pool and a jacuzzi style pool.